Services and Projects Our focus is secondary, vocational and university education of children who would be unable to attend a program beyond primary without help. We have a sister charity focusing on primary education in Bwindi. In total, we have found sponsors for 136 students for the 2016 academic year. We also have provided rainwater collection, dug 2 wells and added filtration of the water at the secondary school. BCP endowed a position of Counselor at the secondary school in 2016 to assist students who have no role model and limited exposure to future possible employment. The new e-Library will open in November. Rural SW Uganda is celebrating the arrival of reliable internet and a library facility ready to serve the community. 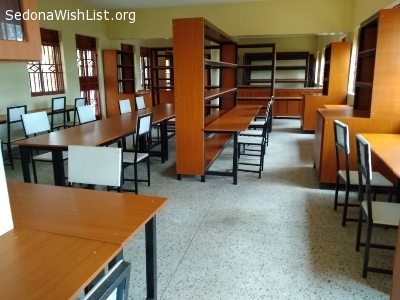 The secondary campus will move its limited supply of books from its original library to the new facility, but the list of books needed to serve this larger capacity is long. The need is great and any contribution would help; from $10 for novels needed for English Literature courses, to $150 for Advanced Science Reference books. Most students cannot afford to purchase textbooks and this facility will allow them time to study after class! Donate on BwindiCommunityProgram.org (the Other Donations page) or call Jan Tanis for help in donating at 204-1135. Imagine not being able to read and write, nor to be able to qualify for a job! In Uganda, this is not unusual, but it is possible to change. 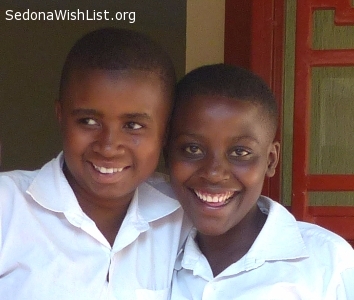 Bwindi Community Program (BCP) matches sponsors with students in need. BCP also purchases books for the sponsored students and for the Counseling Office. These tools enhance the education being provided. The schools loan books to students during class but the ability to refer to them outside of classroom hours is very valuable. Please help us by contributing $15 or more. We will purchase the required Science Lab Workbooks and Textbooks in Uganda. You may write a check to Bwindi Community Program and mail to 20 Soldiers Trail, Sedona, AZ or visit the website bwindicommunityprogram.org "Other Donations" page. The Ugandan school year begins in early February. Students will come back to campus to find a new Science Lab Building. Their Science classes will now include workstations to do experiments and they need Science Lab Workbooks to record their findings and notes of interest. These tools are not provided by the school and Bwindi Community Program wants to make their educational experience complete. For $15 per student, you can help these rural students by providing lab workbooks to get the maximum benefit from their lab time. Donate by check to Bwindi Community Program at 20 Soldiers Trail, Sedona, AZ 86336 or via the website at bwindicommunityprogram.org. There will be smiles to thank you from half way around the world! In Uganda, books are not furnished to the students by the schools. Science Lab Workbooks are especially important to these children because they hold the key to recalling experiments done in class; the outcomes, the details, etc. Bwindi Community Program wants to furnish each sponsored student in the science programs with these essential tools. You can help with a donation of $15 per book. Education is so much better with the right tools. Please make these classes easier for students thirsty for education by donating on the website: BwindiCommunityProgram.org or by mailing a check to 20 Soldiers Trail, Sedona, AZ 86336. The academic year will begin in February and the students are waiting for their tools to arrive! The Chemistry, Physics, Agriculture and Biology Labs are complete, except for enough equipment to provide the best experience for these Ugandan students. A grant provided a beautiful building, Bwindi Community Program assisted by raising some funds for workstations, and now the finishing touch will be to acquire all the necessary equipment. Any contribution will help. We want to purchase balances, beakers, resistors, clocks, thermometers, etc. to make the most of these wonderful new labs. Please contact Jim or Jan Tanis at 204-1135 for donation information. These worthy students will provide the smiles. Life in Uganda is hard. The new Science Labs are complete except for some equipment. The experience of hands-on work in the Labs requires more tools for these budding scientists. A grant provided the basics and Bwindi Community Program is trying to furnish thermometers, chemicals, scales, etc. This opportunity to participate in the experiments rather than be lectured is a phenomenal advance for the students. Please help by contributing to the fund for "Science Lab Equipment". A check of any size will help. 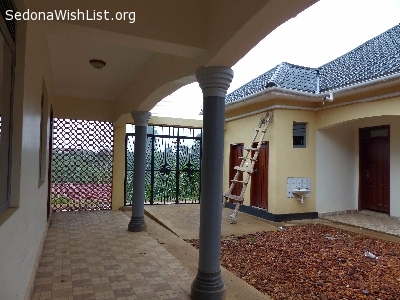 Please make it payable to Bwindi Community Program at 20 Soldiers Trail, Sedona, AZ 86336 or donate through the website at BwindiCommunityProgram.org. These students deserve the best educational experience possible. They thank you! The right tools make a difference! 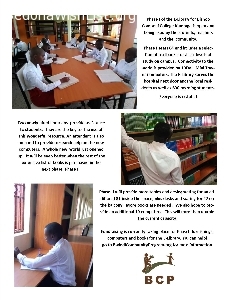 We try to provision our students for the transition to secondary school. It is expensive for rural Ugandan students to go to the next level of education. Scientific calculators only cost $18 each but that is often more than a sponsor can provide when faced with all the mandatory items a student requires to move to secondary. Please help by providing a donation to the Calculator Fund at BwindiCommunityProgram.org or by writing a check to Bwindi Community Program and mailing it to 20 Soldiers Trail, Sedona AZ 86336. It is the little things that make the difference between success and a mediocre attempt. These students deserve all the ammunition we can provide! Students in secondary school in Uganda benefit from being able to use scientific calculators. The transition from primary school requires a lot of provisioning of these students; supplies mandated by the school and personal items for the year of boarding. Bwindi Community Program asks the sponsors to provide a great deal to make this transition comfortable for our rural students. Scientific calculators are not mandatory so are not on the list. But scientific calculators for each student can make a difference in performance. 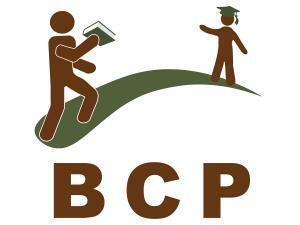 BCP wants to make certain that all the sponsored students have the tools to do well. The calculators only cost $18 each. So much good will come out of so little! Please help the students achieve their goals by having the best tools. Teaching in a rural school in Uganda is a challenge. To attract and retain good teachers, Bishop Comboni School has erected an eight-teacher residential facility with a communal kitchen and dining room. It is beautiful and construction is complete. The only thing standing in the way of occupancy is the lack of furniture for the building. Bwindi Community Program has started a fund to help the school with this purchase. A donation of any size to Bwindi Community Program at 10 Soldiers Trail, Sedona AZ 86336 would be wonderful. We are a 501c3.. You can provide a Happy New Year for the teachers who dedicate their lives to education in a rural setting. Help retain good teachers for a student body of 700! They will love you for it. Teaching in an isolated rural environment can be a daunting. Bishop Comboni Secondary School in Uganda is fighting to recruit and retain good teachers by providing quality housing on campus. They have built a residence for single teachers. Construction is complete for eight residential units with a communal kitchen and dining area, built around an open courtyard. It will house eight teachers as soon as the furnishings are purchased. 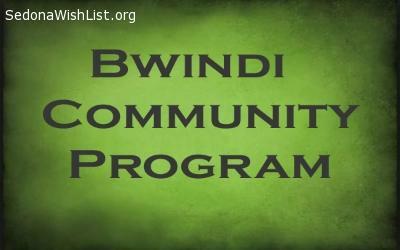 Bwindi Community Program has established a Fund to help complete the project. Please make a Christmas donation that will enhance the academic standards of 700 students! Any amount will be appreciated. Donate online at BwindiCommunityProgram.org or by check to Bwindi Community Program at 20 Soldiers Trail, Sedona, AZ 86336. In rural Uganda, schools face a huge challenge in recruiting and retaining good teachers. Quality housing on the campus is the answer. Bishop Comboni secondary school has erected a residence facility for eight single teachers. It is a super design with eight private bedrooms, a communal kitchen and dining area, surrounding a courtyard. The building will be in use as soon as furnishings are acquired. Bwindi Community Program has established a fund to purchase the necessary furniture. Please help with a donation of any amount. Mail a check to Bwindi Community Program at 20 Soldiers Trail, Sedona, AZ 86336 or visit the website to pay online; BwindiCommunityProgram.org. Jim and Jan Tanis would be happy to talk with you about this project at 928-204-1135. A rural African school's biggest challenge is recruiting and keeping good teachers. Quality housing on the campus is the solution. Bishop Comboni secondary has erected a terrific facility that will house 8 teachers in private, secure rooms with a communal kitchen. The construction is finished. Furnishings are necessary to move the teachers in. Bwindi Community Program has established a fund to make this happen. Any amount of donation is appreciated. For more information or photos, please contact Jan or Jim Tanis at 928-204-1135. 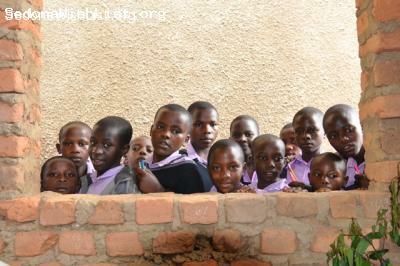 The small library at Bishop Comboni school in Uganda is bustling with activity. We have acquired some textbooks and the students and teachers are lining up to use them. Please help us purchase more textbooks! There are never enough for all those who need them. Books can be purchased for $15 each and mean the world to students (and teachers) who have to share them. 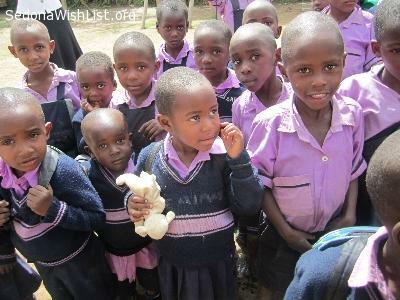 A check to Bwindi Community Program at 20 Soldiers Trail, Sedona, AZ 86336 will produce smiles in a rural school half way around the world. This is truly the Christmas spirit! Each year we have a new group of students ready to attend a Vocational Institute. They have succeeded in graduating from the four years of secondary school that is required for this move. Not all of their sponsors will be able to support the increased costs of this very important next step. We have established a Vocational Supplement Fund to supplement the tuition, when this occurs.The students will become independent and productive members of society when they complete this final step in their education; nurses, teachers, mechanics, electricians, etc. This final hurdle is not always easily handled. The Fund makes it possible for Bwindi Community Program to put the student in school while searching for a source of funds. It is the difference between success and "almost there"! The Sciences are difficult for most of our sponsored students. Having their own workbook to take notes during a lab project is crucial at exam time. The Science Lab Workbooks are purchased each January for the students. We would like to purchase a supply of workbooks so all the students have this tool. The Workbooks are $15 each and we will need 40 in the coming academic year. They must be purchased in Uganda to conform to the Government Standards for the schools. Check out BwindiCommunityProgram.org or contact Jan Tanis at 204-1135. These students deserve all the available tools! 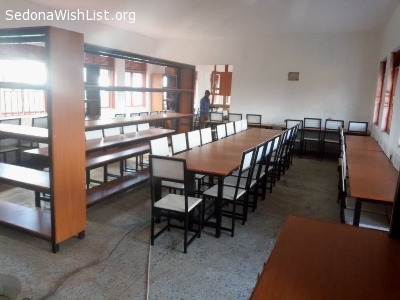 We are very happy to have found support for our campaign to fill the Library at Bishop Comboni Secondary School in Uganda. There are still a few empty shelves and a list of texts assembled by the Headmaster to fill the gaps. The library is currently getting a lot of use from students and faculty alike. We are grateful for the funds received to date and hope to provide more texts, costing approximately $15 per book. Please contact Jim or Jan Tanis at 928-204-1135 or mail a check payable to Bwindi Community Program to 20 Soldiers Trail, Sedona AZ 86336. We are a 501c3 public charity and your donation will be tax deductible! Bwindi Community Program (BCP) has learned about the need for Textbooks and Science Lab Workbooks at the rural Uganda secondary school where our older sponsored students study. There are never enough textbooks to allow each student to have one in their possession for a term. They have to be one of the lucky students to find a book in the library when they need it. Science courses should be accompanied by individual lab workbooks. They allow the student to keep a personal record of the lesson in the lab. It is an invaluable tool in learning some challenging subjects. BCP would like your help to provide these for the students who cannot afford them. Enhance the education of these students by writing a check to Bwindi Community Program for $15 each textbook or workbook. You may also donate online by visiting our website BwindiCommunityProgram.org. There is hope for a future for these children through education. The secondary students go home on break to a very rural village three times per year. They must perform family chores during the day and want to study in the evening. It is impossible in an environment where there is no electric service and only commercial lodges can afford to run a generator. The situation creates lost time and frustration for the hard-working students who return to school for the new term in need of help to regain their proficiency. A simple solar powered lamp would light up their evening and allow that precious study time while they are away from school. A good quality lamp can be purchased for $17 per student. The thirty eight students in secondary school will cheer your kindness. The primary school where our sponsored students board is in need of blankets. We have been able to fund 94 to date and the school needs 170. We are hoping to provide funds for another 76 blankets. They only cost $16 each. They will keep a student warm in the chilly equatorial night. You will make the night much warmer! Bwindi Community Program sponsors children in a primary school at the equator. The nights are chilly. We have raised funds to provide 94 blankets for the boarders. There are 170 children who board, so we need 76 more blankets. Each blanket costs $16; a small price for a warm night! 20 Soldiers Trail, Sedona, AZ 86336. The children will be very happy. The Primary School where our sponsored children board is in need of blankets. We have been successful in raising funds for 94 blankets. That means we only have 76 to go in order to have all 170 boarders at the school covered. The school is at the equator but nights are always cool. Each blanket costs $16. Buy one to provide a cozy night for a student away from home!